Trotz – It Is Probably Not What You Think It Is! | "Northern Crossings"
Trotz – It Is Probably Not What You Think It Is! Despite how it sounds, “trotz” is a German genitive preposition that searches for an object in the genitive showing possession. Or so I am told. It means “despite” or “in spite of”. I am told that Luther’s writings are full of the word. Look at the Knight I mentioned in the last blog. Here is a close up of his face. Death is trying to flash the hour glass before him to show him the grim march of time and the approach of his own death. 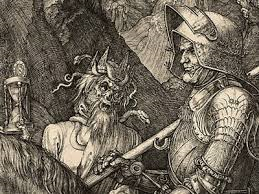 Behind him the devil seems to be depressed because the Knight pays him no attention. He seems to hold them in contempt. Luther’s writings are full of the word “trotz” because the Reformation is a monumental shift in a world view. “In spite of” a world view that never wanted to abolish the fear of death and hell because it “kept the rabble in line” and paid the bills Luther reveled in the fact that “in Christ” he was free. In spite of the popular opinion that salvation was mediated through the church, Luther’s joyous pen broke the barrier between the individual and God and at the same time made sure that the individualism that leads to another kind of separation from God was defeated by explaining that the Christians new found freedom could only be expressed in service to God and the neighbor. In spite of the terrors of hell and death Luther joyously resigned himself to God’s control. His ribald, and some would say offensive speech, not only mirrored a ribald and offensive age but transformed it into a time when people could be freed from the terrible obligation of defining both themselves and the world to others. Luther saw the ultimate freedom in allowing God to interpret us. In spite of attacks on his reputation, his family, his personal life and health, Luther and the other reformers held the powers that be ultimately in contempt because they were not the ultimate. In spite of his own sin, fear of death, and fights with the devil Luther was confidant because he let go of self confidence.